LG Optimus 7 is a Windows Phone 7 device which yet to have to USB Internet tethering officially supported and enabled by mobile service operators and carriers. However, the USB tether functionality is built-in in the phone, and only been locked away pending chargeable Internet tethering data (3G, 4G etc.) subscription plan. Hackers have managed to crack open and enable the Internet tethering via USB on Samsung Focus and Omnia 7 Windows Phone 7 devices, HTC Windows Phone 7 devices and Dell Venue Pro WP7 smartphone, and now it appears that LG Optimus 7 can be used as a tethering USB modem to share the Internet connection connected via mobile network with computers. The hack to enable Internet tethering on LG Optimus 7 is similar to hack on Samsung WP7 mobile phones, but the hack was not possible previously as users were stopped by a request to supply a password to access the MFG application, which contains various diagnostic applications, including a rudimentary registry publisher, security camera policy editor and USB tethering setting. 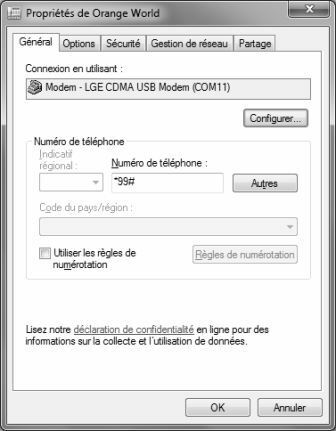 And now the password has been released by smartphonefrance.info, and the Internet tethering hack on LG WP7 mobile phones is now possible. Download and install the Zune software from zune.net. Launch the LG phone dialer, and dial ##634#, then press the Call button to bring up a list of applications under the screen title of “MFG”. When asked to input password, enter 277634#*# to unlock the password-protected MFG. Turn off the data connection in Settings -> Network Mobile. Start MFG and go to the USB Switching option in Menu Engineer -> Port Setting. Select the QC COMPOSITE and validate. The phone will automatically restart to activate the setting. Connect the phone to PC with a USB cable. Windows should automatically detect the Windows Phone 7 and install driver from the device. A phone modem named LGE CDMA USB Modem will be installed. Manually create a new dial-up connection that uses the LG USB modem with phone number to dial as * 99 #. Dial the modem, and the Internet tethering should be enabled. While tethering via USB, the synchronization with Zune software may not be working. In this case, just disconnect the USB cable and connect over Wi-Fi connection to sync up with Zune software. And the disclaimer is that the hack violates most mobile carrier’s terms of service, and may cost users a lot of money for overage charge if they’re on limited data plan.